Choi Soon-sil, who is at the center of the President Park Geun-hye scandal, withdrew the testimony she gave at a prosecutorial investigation, denying all charges brought against her, during her trial in Seoul on Wednesday. At the same court, An Chong-bum, Park’s former aide suspected of being an accomplice to Park and Choi in their alleged crimes, challenged the validity of key evidence: his handwritten memos. “During the investigation, Choi was forced to make confessions. 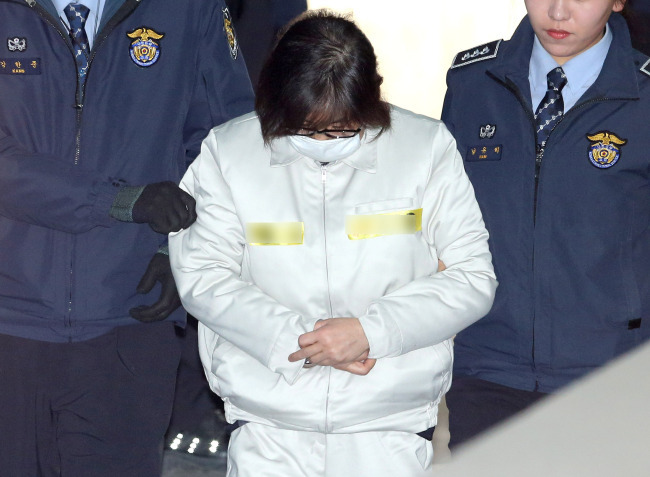 We contest the voluntariness of her (previous) statements,” said Choi’s attorney, Lee Kyung-jae, during the second hearing of the high-profile trial that could affect the ongoing impeachment trial of President Park. State prosecutors refuted Choi’s claim, saying there was no pressure or coercion on her to confess. “She didn’t make any confession in the first place,” said a prosecutor at the trial. They also stressed that An’s memo books were seized in a warranted search of his home and office. Prosecutors raised questions about the ulterior motive behind the “groundless claims” made by Choi and An. “We cannot help but suspect that the president is behind this and that the defendants are conspiring to hinder this trial and to stop any evidence that may work against the president from being admitted,” the prosecutor said. President Park, Choi and An are accused of extorting money from conglomerates for foundations controlled by Choi, among other allegations. Park, immune to criminal liability as a sitting president, is standing trial for impeachment at the Constructional Court, while Choi and An, both currently jailed, are fighting at the Seoul Central District Court against charges including abuse of power and attempted fraud. State prosecutors allege that Choi and An pressured 50 companies, including the country’s largest conglomerate Samsung, to donate 77.4 billion won ($65.1 million) to two foundations controlled by Choi. The entities -- the Mir and K-Sports foundations -- are suspected to be covers for channeling money for Choi’s personal gain. Choi’s attorney Lee rejected the accusation at the hearing, denying her involvement in the corporate fundraising. Choi simply gave advice to the president about issues involving the two foundations at Park’s request, Lee said. An’s memo books, which detail the president’s directives regarding the donations, are seen as one of the most important pieces of evidence that could implicate all three in this massive corruption and influence-peddling case, along with two tablet PCs alleged used by Choi. The memo books, totaling 16, were handed over to the court Wednesday, although the judges will have to determine whether they can be accepted. Choi also denied the ownership of the two tablet PCs. One of them was obtained by a local TV channel and ignited the scandal in October last year. The other was recently submitted by Choi’s niece, Jang Si-ho, to Special Counsel Park Young-soo. The second device secured by the special counsel team contains emails regarding Samsung’s provision of financial support to Choi’s German businesses, Lee Kyu-chul, spokesperson for the special prosecutors’ office, told reporters Wednesday. The Seoul Central District Court will hold the third hearing in the Choi-An trial next week.